Good morning fellow crafters! I hope everyone had a great (and restful) Thanksgiving break! I must say mine went by way too fast, and I had way too much to do for someone on vacation :)With that said, welcome to the Calendar Blog Hop hosted by Zeni @ Scrappy Zeni. If you just hopped over from Amanda's @ Amanda's Crafts and More, you're in the right place. If you're just stopping by for a visit, then go to Zeni's to start at the beginning. For today's project, I decided to make an advent calendar. I've never made one before, and I don't think I realized how much time it would take for all the little details (because I'm a bit of a perfectionist) - so needless to say, you only see the first 12 days of the countdown here. Anyways, I love the idea of using a mini-cupcake pan for the calendar, because it's the perfect place to put a little surprise. The back of the numbers are magnetic sheets that I cut using the cricut (really easy). Roberta! This is super cute! I would have never thought about using a cup cake pan for something like this. Thank you so much for joining me in this hop! Hi Roberta, your first 12 days of advent calendar are so cute. I love that they are magnetic. Thanks for sharing! This is fantastic. Gorgeous idea and I love all the detail. Happy to be joining your hop, already a follower! Great project. I love the cupcake pan idea. Wonderful details. How stinkin cute! What a great idea!! Very clever idea and so inspiring........cyberhugs! This is really neat, I like the use of a muffin pan over a cookie sheet! What a great idea-super cute! This is really fun! I love the number font on these! WOW!! What a super fun and creative calendar!! What a neat Advent and I been thinking of making one myself but this is so kewl! :) TFS and this gives me some ideas so that is great! Nice job. This is a great idea thanks for sharing. Clever idea using the cupcake pan! Your 12 days are so cute and the details are wonderful! This is great!! Love the magnets and all the lit detail you put into this. It was nice doing this hop with you. Im now a follower as well. What a creative idea!!! it's so cute!!! GREAT GREAT IDEA! this is super cute easy and fun! Thanks for sharing! My kids would be thrilled with this. love this idea! thanks for the awesome hop! Great idea using the tin and your details were worth all the effort! TFS..new follower! What a great idea. The paper you usd coordinates nicely. Wow! I love this! I can see why it would take so long to finish one of these though! LOL! What a fun and creative idea. Wow ... a lot of work went into your project and it's sooo cute. Great job!! What a great idea using a cupcake pan, very creative! 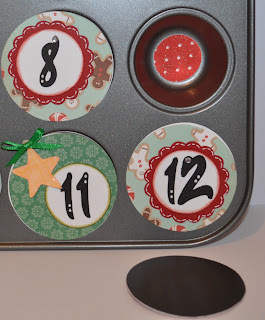 Terrific advent calendar Roberta. I love that you used the mini muffin tin, what a great idea, and the tags you made are all adorable! oh sooo cute! love the magnet idea too!!! 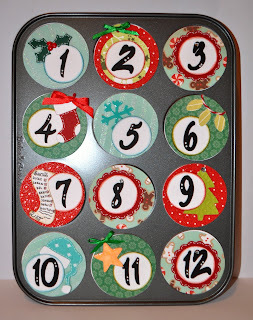 Cute and yummy idea for an advent calendar!